I live in Canada. It's cold and snowy for months at a time. Staying indoors is not really an option. So I enjoy winter sports in my somewhat inept way. You already know that I curl. I also cross-country ski. I'm incredibly fortunate to live within a 20 minute drive of Gatineau Park, which has over 200 km of ski trails that wind up and down hills, past beautiful frozen lakes, rocky cliffs and through mature forest. Today there was fresh snow, the temperature was -13C, and the skies were blue. Fantastic! * Or working as a lawyer. Now that would make for a boring blog post! I thought I'd generate a bit of interest, but was surprised by the number of people who have been pining for a Dritz Bound Buttonhole Maker. Then I looked to see what prices these things command and goodness me! Some folks have paid more than $40. Not me, I can assure you! Please get in touch with me at KayJYoung at gmail dot com, and tell me where to send this holy grail of gizmos. To the rest of you, I promise to be on the lookout for more of these or other interesting tidbits. 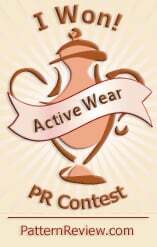 Maybe I'll have another blog giveaway before another 27 months have passed. I am pretty sure I can only ever use one, so in honour of my blog's existence since November, 2009, I thought I'd have a blog give-away. Leave me a comment, if you are interested, and if more than one of you applies, I'll try to figure out how to generate a random number, or something. Extra chances to get this lovely if you leave me a particularly amusing comment! I'll send it anywhere on the planet. Sewing first. I have muslins! The dress is basically fine. Well, it will be once I remove 1cm in length from the bodice (where marked). It looks OK on my form, but definitely feels too low on my body. I briefly considered removing the pleats from the right front skirt and replacing them with a princess seam, but changed my mind when I couldn't immediately see how to reshape the piece. I want this to be a relatively quick project! This is a pattern I would never have considered until recently, but I feel I can wear this slim-skirted style after losing 5cm (2") of circumference from my hips/thighs due to an aggressive exercise regime (Spartacus workout, if anyone is interested; it's brutal but I can attest to its effectiveness). Here is the jacket. I needed to make more changes to this pattern. Maybe I've also gained inches through my rib cage but this jacket is way too snug above the waist for a lined jacket in my fabric, a fairly substantial wool bouclé. 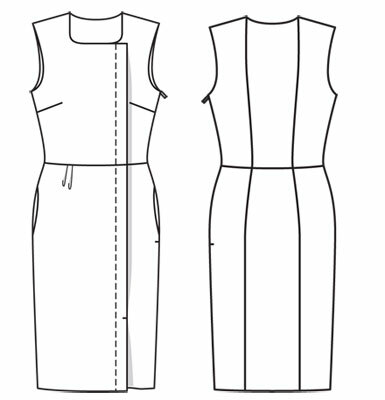 At the same time as the rib/waist is too tight, the hem is too flared and the back bodice darts add too much shaping. I got rid of some of the excess shaping and added width by reducing the dart take-up in the back, and smoothing out the curves in the seams of the lower part of the jacket. As usual I had to shorten the sleeves, but by more than usual - a total of 5cm. I do have short arms but is it only me that thinks Burda are designing for Ms. Gorilla? The other feature of this jacket which left me cold is that the back is about 3cm shorter than the front. Maybe you can see this in the picture with sleeve raised. I levelled the hem. The jacket is cut out. Single layer to match the plaid. Here is a quick snap of my fabric combination. Colourful, no? And I've also been knitting. My new project is this top, from the spring/summer 2009 edition of Vogue Knitting. Vogue makes their older patterns available for download for $6 through Ravelry. I fell for this in a big way and purchased yarn for it when I was in Toronto last week. I got to visit Americo Original and Romni Wools. All I can say is "Oh my!" Between the two stores I think one could purchase yarn in any combination of natural fibre. I'm making the Leaf Yoke Top from Americo "Baby Suri" (80% suri, 20% wool). I know what you're thinking. But she was apparently named after the silkiest, smoothest kind of Alpaca there is. Baby Suri is sport weight which gives the wrong gauge so I'm knitting the large size. The calculator says it should work. My fingers are crossed. Two of them. They are on my feet. Yummy wool. And now: back to making muslins. That's what The Sewing Lawyer was, this weekend. Not only is the Burda jacket from a year ago (mentioned in my last post) traced, so is the about-to-be-famous colour blocked dress from the February 2012 issue and a pants pattern that could easily be overlooked from the same issue. 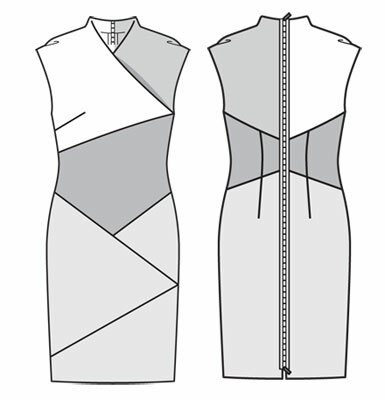 And I'm half way through tracing another dress from this very month's Burda Magazine! Three items traced from the latest edition, within 3 days of purchase. It's a new world record chez The Sewing Lawyer! This dress is the reason I called my local purveyor of magazines on Friday. The February Burda had already come in! I was out of the door like a shot. I'm not first to have at this one. I am pretty sure that Audrey has that distinction, and Melissa is second. Their dresses are fabulous! There will be MANY more of these, I predict. In my drive to use fabric from stash, I located some burgundy wool double knit. 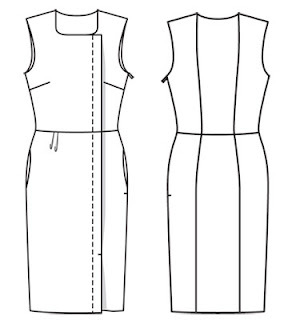 My only hesitation in using this fabric is that it is quite firm, and based on flat pattern measurements, this dress is designed with negative ease. I am hedging my bets with extra-wide seam allowances at the side seams and CB. I'll need a working zipper. I have no intention of having a shiny strip down my backside, so my non-colour blocked and non-exposed zipper dress will be a good deal less zoomy than Burda intended. However, I think it'll be a great dress anyway. These pants are designed for knit fabric and I have some beefy black RPL ponte knit in stash. It's the same stuff I made my curling pants from. And my bike shorts. 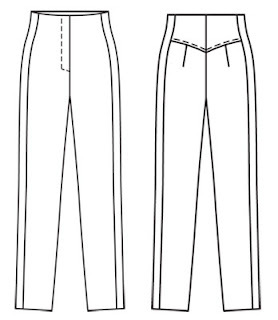 This pattern could be a favorite due to its high waist, slim profile, interesting back yoke, and the strip of fabric that runs vertically between the front and back pieces. 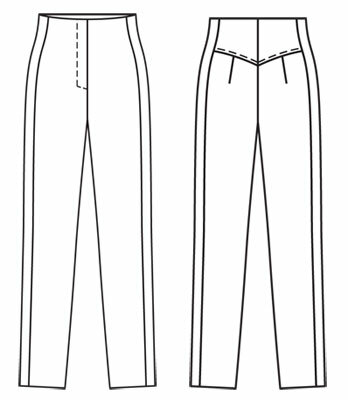 I made a jeans pattern with the latter feature from the June, 2004 issue so many times I lost count. The strip smooths out one's hip curve very nicely. I have high hopes for these. Last but not least, I love this dress! It has lots of seams for fitting possibilities, and an interesting off-centre faux-closure detail (in fact there's a zipper inserted in the side seam. I have some amazing turquoise wool crepe which will look great with the chunky bouclé I have earmarked for the jacket. February could be a sewing marathon! Does one sock count as a finished object? I guess not. However, it's a milestone since it's the first one ever off needles wielded by me. One side has no hole at the top of the gusset. Wish I could say the same of the other side. More importantly, I wish I could remember what I did so that I could repeat whatever gave this result. 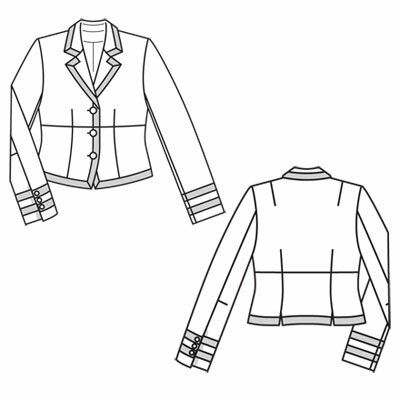 I'm still thinking about sewing, and I have mostly finished tracing this jacket pattern from the February, 2011 issue of Burda Magazine. Except I won't be using braid around the edges. I've got some luscious predominantly green/aqua tweedy bouclé on deck for it. First up will be a muslin. But in the meantime I'm working on sock #2.